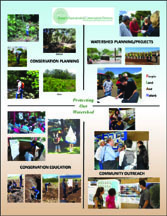 The Hawai‘i Association of Conservation Districts (HACD) are comprised of 16 Soil & Water Conservation Districts (SWCDs) throughout the State of Hawai‘i. HACD and the SWCDs work together in a variety of ways to help protect and sustain Hawai‘i’s natural environment. 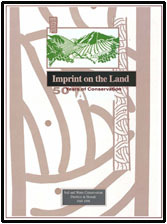 Throughout the late 1940’s and early 1950’s, the Soil Conservation Districts (SCDs) emphasized Hawaii’s growing conservational needs and concerns to the legislature. This call for attention prompted the legislature to recognize the importance of the SCDs and their ability to address such concerns, as well as their dedication toward conservation and service to the community. As a result, monies were appropriated to the SCDs in order to hold a 2-day conference on Oahu. The districts used this meeting to help launch their organization. On September 16, 1954, after more than a year of planning and support from district directors, legislative supporters, the National Association of Conservation Districts (NACD), and government agencies, the SCDs form the Hawaii Association of Conservation Districts (HACD) and hold their first meeting. During this meeting, the articles of organization are adopted and the district directors elect their first HACD president, secretary-treasurer, and five island vice-presidents (one for each of the five major islands). Until today, the HACD continues to hold their Annual HACD Conference (elections occurring biannually) as well as quarterly meetings, with the location of the annual meeting rotating among the islands and their hosting SWCDs (HACD Constitution and Bylaws). Also, HACD and the SWCDs continue to work closely with a variety of Federal and State agencies including the U.S. Environmental Protection Agency (EPA), the US. Department of Agriculture’s (USDA) Natural Resources Conservation Service (NRCS), the University of Hawaii and the Hawaii State Department of Health (DOH). In addition, through an agreement with DOH, HACD has been able to hire four Conservation Specialists (one in each County) in order to assist the districts with Conservation planning and further promote local agriculture and watershed stewardship throughout the community. The Soil & Water Conservation Districts (SWCDs) are legally constituted self-governing sub-units of the Hawaii state government organized under the 1947, Hawaii Soil and Water Conservation District Law, known as Chapter 180. Hawaii Revised Statutes Chapter 180, as amended, outlines the duties and powers of the SWCDs to administer and conduct soil and water conservation activities within the State of Hawaii. Since 1967, the Hawaii State Department of Land and Natural Resources (DLNR) has provided the SWCDs with funding and administrative support. Each of the districts are governed by a board of five directors, three elected by agricultural land-users or land-owners and two appointed by the SWCD directors. In order to aid the districts and their directors, associate directors can also be appointed. These SWCD directors and associate directors are volunteers who are concerned about the well-being of our communities and sustainability of our island’s natural resources.